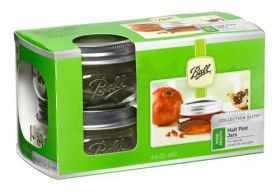 Ball® Collection Elite® Brushed Silver Wide Mouth Jars capture your creativity. Perfect for sharing, this jar has a contemporary style that is ideal for creative preserving and storing. Elegant enough to take your fruit dressings, veggie and fruit salsa, luscious pie fillings and colorful fruit syrups from the kitchen to the table, these uniquely shaped jars hold endless imagination. The Ball® brand helps keep your creations fresh and beautiful!